wouldn't it make more sense to be Baghdad instead of dadgab? I assume there are no tabs for this music--or is there? This song is awesome !! Well the commercial of the website was very promising but when it comes down to explaining how to play the song it´s very unclear why dont you guys explain what chords to hold during the play well you can put in on loop but it takes a lot of time to figure it out or do i missing the section somewhere where it´s being explained? It's being worked on, but as you can imagine tabbing a song like this is extremely difficult so Matt has chosen to make sure it is 100%, completely accurate before releasing it to the public. I cant get the printer supplement to dispaly or print the informatiom. it comes out blank!. lesson no 5 Goby is nice. I learnt something special from this lesson. 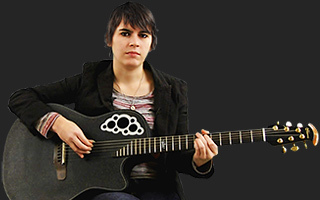 thanking kaki king Mem. I don't know what she's using on her acoustic. We did some lessons on my electric and she asked for D'Adario XL's. Might point to what she's using on her acoustic as well. I just heard this song on XM/Sirrius. Way cool.